Hello! I hope everyone enjoyed Thanksgiving. I took my two kitties and went to my Mom’s. She was patient with the cats who despite crying in the car for 2 hours, settled right in. We had a nice dinner with family with lots of visiting and good food. I once again made a roasted delicata squash stuffed with grain pilaf. This year I made it with faro and black rice, in an effort to use what is in my pantry. I didn’t get a picture but it was really good. I also made a pumpkin pie from a macrobiotic recipe. Sweetened with maple syrup, with a little coconut milk, two eggs and some arrowroot. Although it tasted great, the texture was a little gelatinous for me. I will try something else next time. I love pumpkin pie so I may make one soon! It makes the best breakfast! 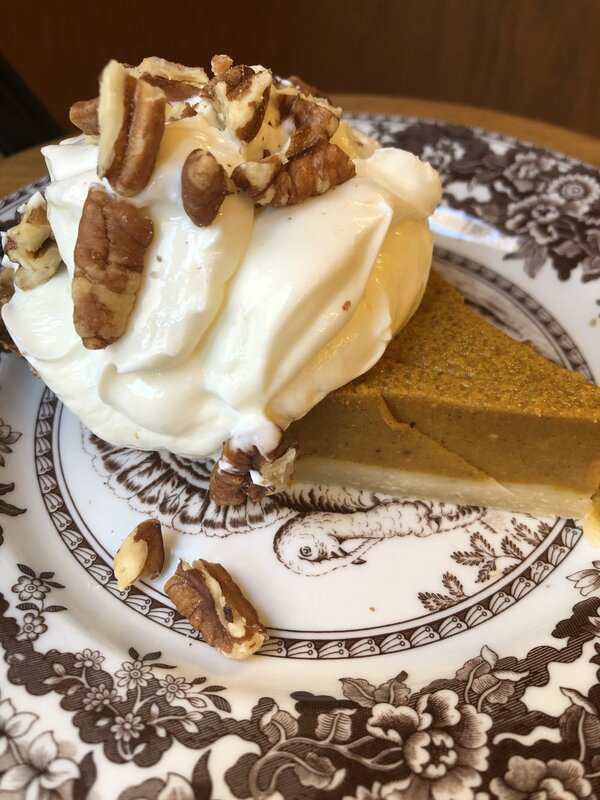 The picture below is my post-Thanksgiving morning treat, topped with thick Greek yogurt and pecans. Yum. If you follow my posts on Facebook or Instagram, you know I am enthralled with the Fall leaves. It is just my favorite time of year. I won’t bore you with lots of photos but here is one of my favorites. I loved walking in the thick pile of leaves on this little corner. As for food, here is a recipe for you. Before I share, I’ll give you a little history for why I was baking grain-free. I have the early beginnings of arthritis in a few fingers. The kind where your joint is swollen and red. :( I do not want that so I have been working with an integrative medicine practitioner to resolve that, overall reduce inflammation, as well as hopefully work on cancer and diabetes prevention. My HgbA1C has been 5.6 for the past three years. That is only .1 lower than the lower limit of the range for pre-diabetes. I likely have leaky gut syndrome since most of us in the US have it. (Poor diet and antibiotics are contributing factors. You can read about it here. ) Limited grains and of course sugars, processed foods etc are part of the recommendations for all of my goals. I also had food sensitivity testing done which showed unfortunately I have sensitivity to peanuts, cashews and almonds. Too bad ‘cause I love them all and ate tons of all three. (One more indication of leaky gut - sensitivity to foods you eat in abundance.) In the last 7 months, I have cut out peanuts and cashews, and all almonds except almond flour and a little almond butter. I have also added in quite a few supplements to correct deficiencies and for prevention. I am quite low in vitamin D, B12, and zinc. I take berberine (read about it here) which is a supplement for blood sugar support. I have experimented with lots of foods and here is what I have found. Dairy does not illicit any symptoms. Crappy white flour gives me low blood sugar. symptoms. Good grains including all bread in France are no trouble. Peanuts make my joints worse for sure. Sadly, almonds also do. I thought blanched almond flour was working but sadly no. The good news is my arthritis is gone unless I eat the nuts. Also, my HgbA1C dropped by .2 to 5.4 when last checked. So all good! The moral of the story is two fold. First, you can easily experiment with what you do and don’t eat and, if you pay attention to your body, you can learn a lot. Secondly, there are lots of delicious options for food, even when you are not eating the mainstream standard American diet. I have been baking with blanched almond flour and while the results are great, I’m going to stop for awhile since now I know it does not agree with me. You, however, should give it a try. These scones are delicious. Now, if you are expecting a flaky, doughy, crisp on the outside, soft on the inside scone like a traditional one made with lots of butter, white flour and sugar, you will be disappointed. If you are a looking for a flavorful, not too sweet, soft sort of biscuit, you are in luck. Be careful as the dough is a little wet, but the results are a really nice alternative for breakfast or a snack. I hope you will try them. In the meantime, I hope you’ll join me in this crazy experiment of really paying attention to what you eat and how it makes you feel! Whisk together the flours, baking powder, and salt in a medium bowl. In a large bowl, mix the maple syrup, yogurt/kefir and vanilla. Gradually add the dry ingredients into the wet, stirring to make a smooth batter. Stir in the pecans and chocolate chips. Scoop the batter onto the prepared pan. Shape into a circle about 2 inches thick. Cut into wedges. Carefully move the wedges away from each other to leave about an inch space between the sections. They likely will not hold their shape well….don’t worry, just pat it into the shape you want, cleaning the parchment as needed. Bake 10 to 15 minutes, until set, barely golden on top, but golden brown on the bottom. Let cool on the pan a few minutes, then move to a wire rack to completely cook. These are a little fragile and soft in texture. Store in a sealed container for 3 days. Also good cold!